A simple machine, or a curious invention, with a repurposed real radio vacuum tube as the focal point. 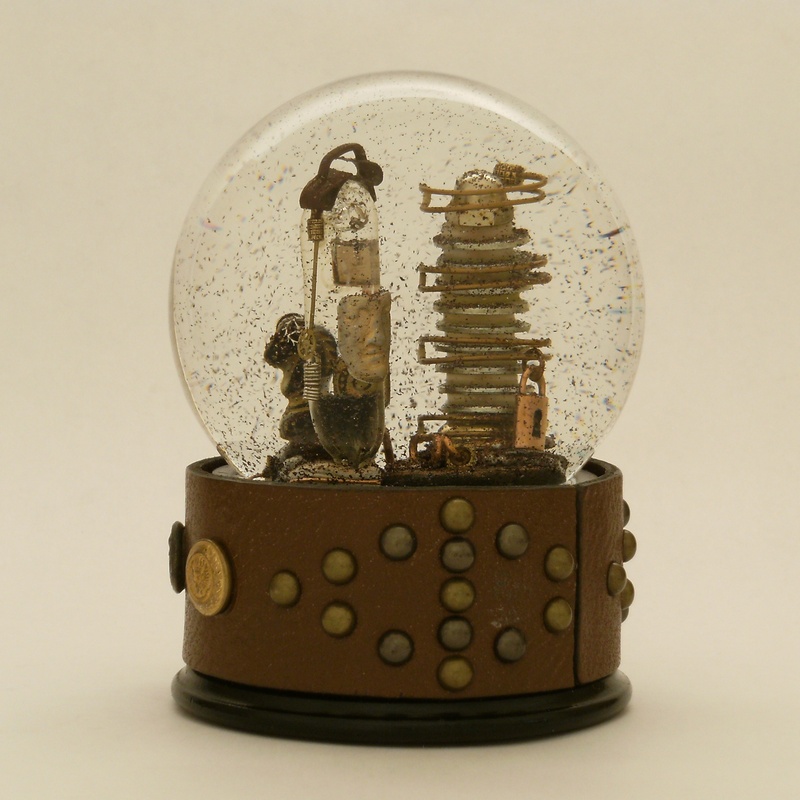 This tiny sculpture features a battered barrel of fuel, copper coils, measuring devices and assorted gears, bathed in a glittering shower of sooty dark dust when the globe is shaken. The custom base is wrapped with a canvas belt and rows of brass and metal details, and finished with a twine-tied corset closure. As the title implies, it remains silent, but oh, the stories it could tell. 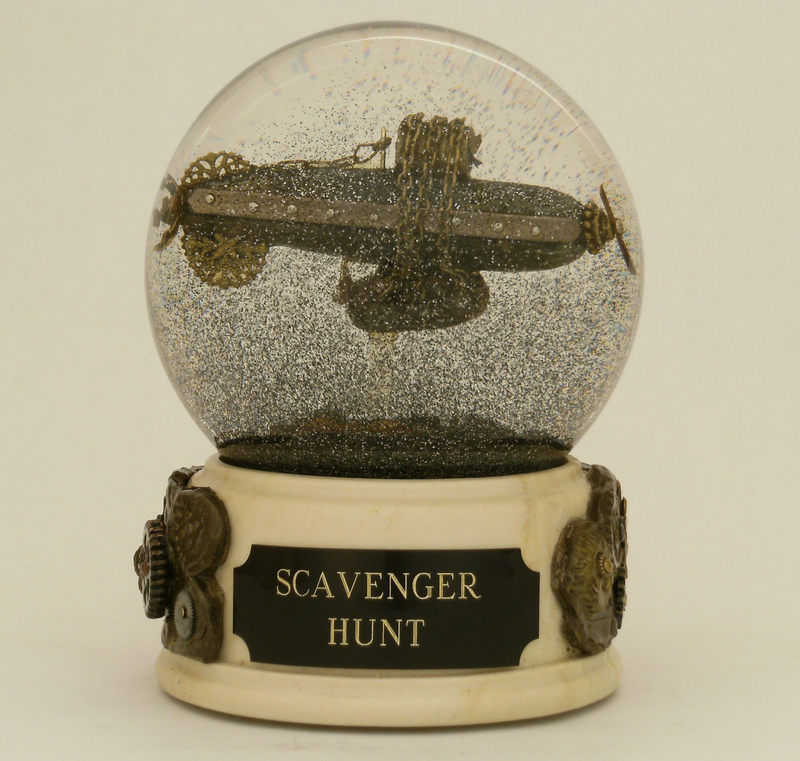 May we present to you, the elusive double snow globe. 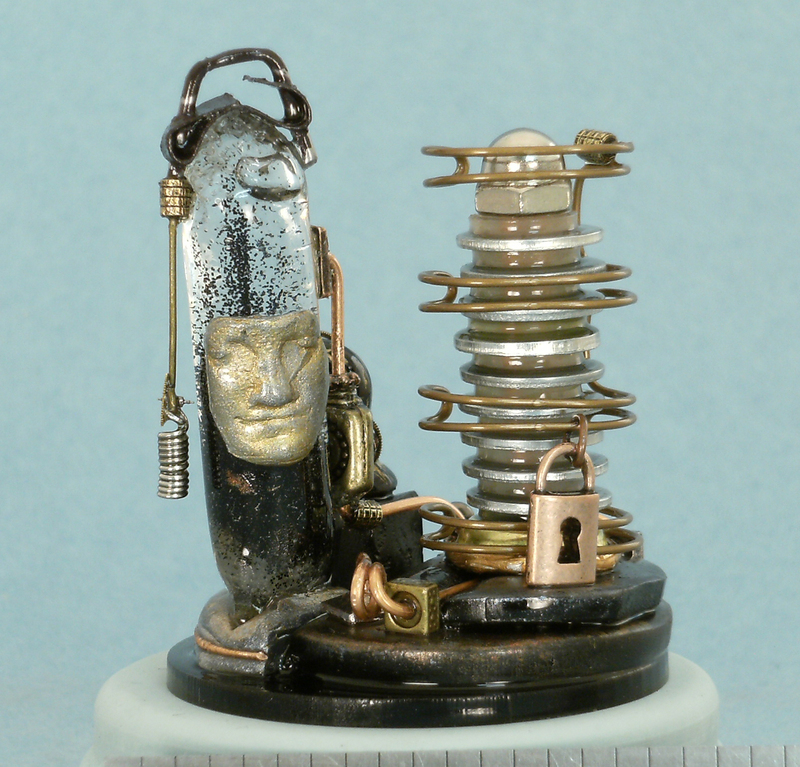 Inside the glass globe, with a curious tower of metal and glass, a tiny chess piece waits, wearing blinders made of watch gears. Rising in the globe is a second clear tube, filled with shimmering crushed crystals which are black as coal. When the waterglobe is shaken, a storm of black dust swirls in the liquid, but a second storm occurs inside the clear tube as the denser black pieces come to life within. On the exterior of the tube, a knowing face smiles serenely, never betraying the secrets inside. A dark heart emerges from the smoke and glitter, held firmly in the grasp of golden fingers. 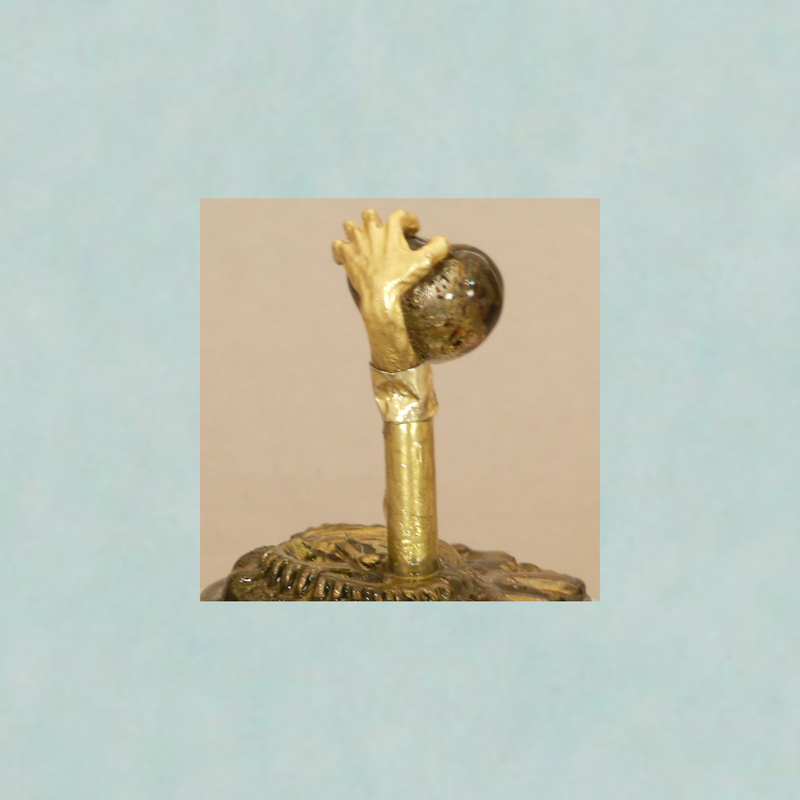 With heavy glittering dust in shades of charcoal and black, this globe becomes nearly opaque when shaken, and the hand and heart appear to rise slowly from the ashes as the smoky dust settles. The sculpture moves between glimpses of hope, strength and darkness, as the solid hand and heart emerge triumphant from the swirling ashes. 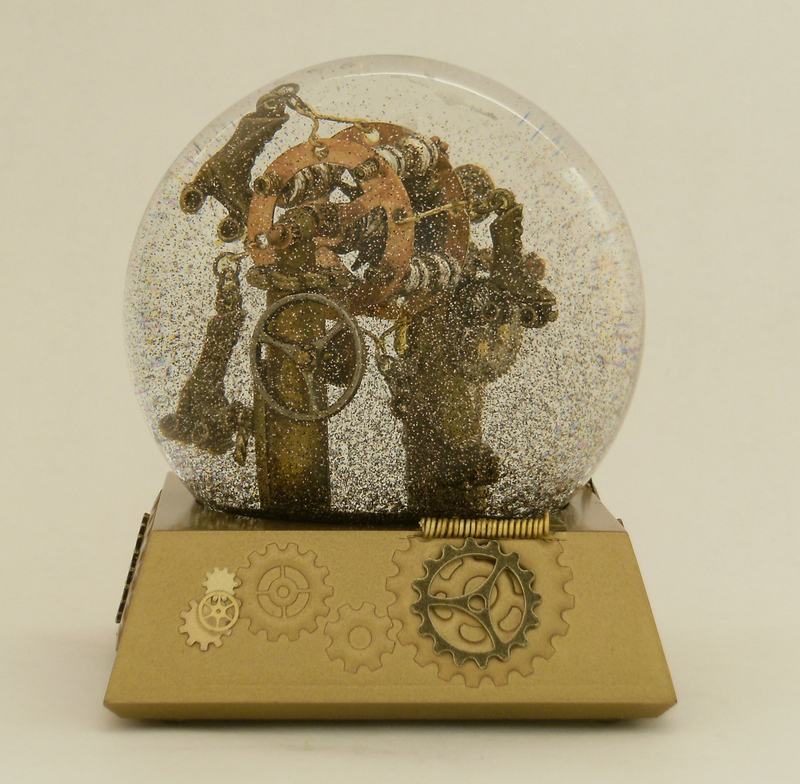 One of a kind, shakeable waterball (snow globe) with metal hand and support, grasping a glass heart with flecks of gold and black foil detail inside glass. Exterior base is wood, with aged paint detailing and hammered antique brass filigree embelleshments on each of 8 corners. As Einstein said once, time is relative. He may have been talking about the physics of moving objects, but I think it applies to ripping open an envelope you’ve been waiting for with excitement, pacing the doctor’s waiting room, and to waiting in lines at an amusement park. It goes fast when you are having fun and slows down when you are waiting for something wonderful (or painful) to happen. Sometimes it seems minutes and hours just whiz by, and you don’t know where the time went. Anticipation, and fear, can make time feel warped and twisted. 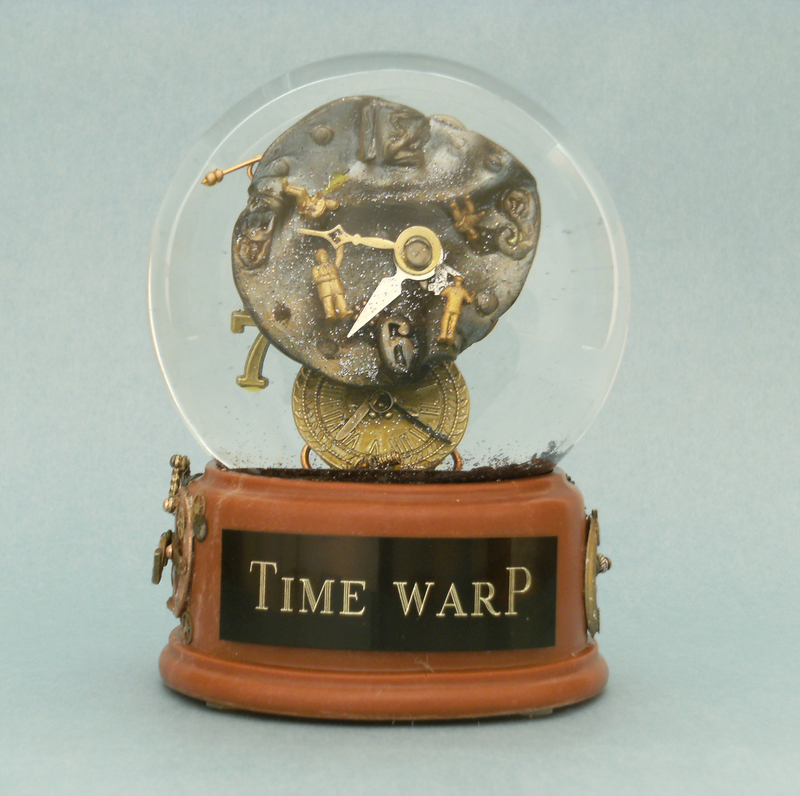 “Time Warp” is a handmade liquid-filled snow globe with two clockfaces, back to back, and a few extra timepieces, including an hourglass thrown in for good measure. On the largest clockface, in front, tiny people figures ride the arms, count the minutes and wait. Time has warped and no longer has a point of reference for how much as passed. Instead of traditional snow, the liquid fills with a mixture of iridescent dust and silver numerals that have become separated from the clock, setting their own pace as they swirl and fall. “Time you enjoy wasting, is not wasted time.” – Marthe Troly-Curtin. “Let’s do the Time Warp again.” – Rocky Horror Picture Show. 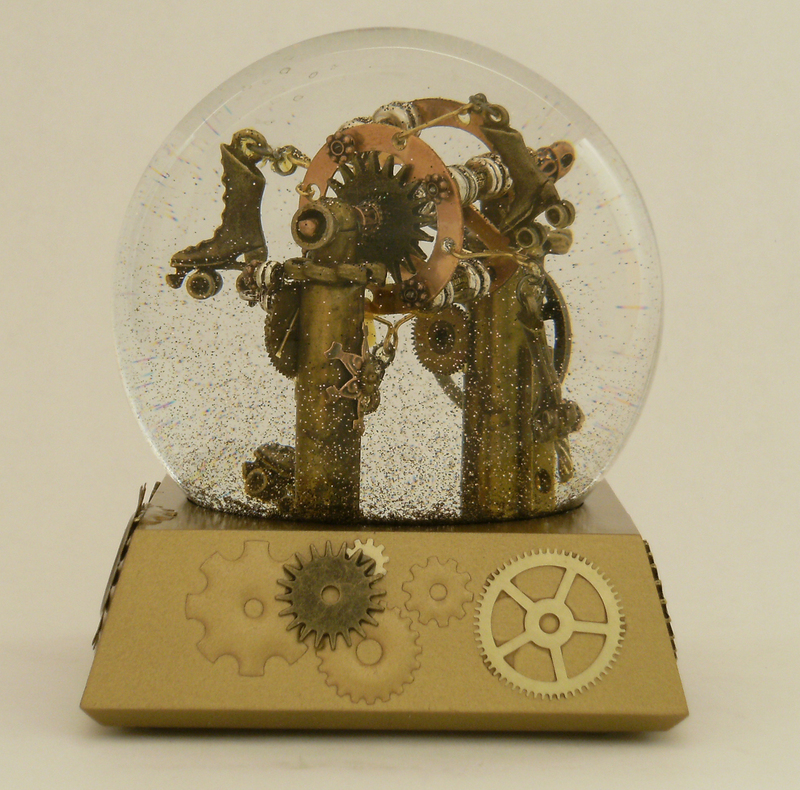 A tiny Ferris wheel contraption with four antique brass roller skates instead of seating is enclosed in a glass globe with shimmering liquid, for those who like endlessly “skating the issue,” steampunk-style. It may have wheels, but this curious invention is going nowhere on purpose. Now I know that “skirting the issue” reminds me of when someone wraps around a banquet table, ostensibly to cover up anything the guests don’t need to see, a place to tuck your problems, wires, empty dishes, etc. behind the curtain. But what is “skating the issue?” I imagine it’s when the issue is like a spot of cracked, thin ice, and one skates around it, but tries ever so hard to avoid it. That of course, would involve ice skates, and these are old-fashioned four-wheeled roller skates, so the analogy doesn’t work at all. 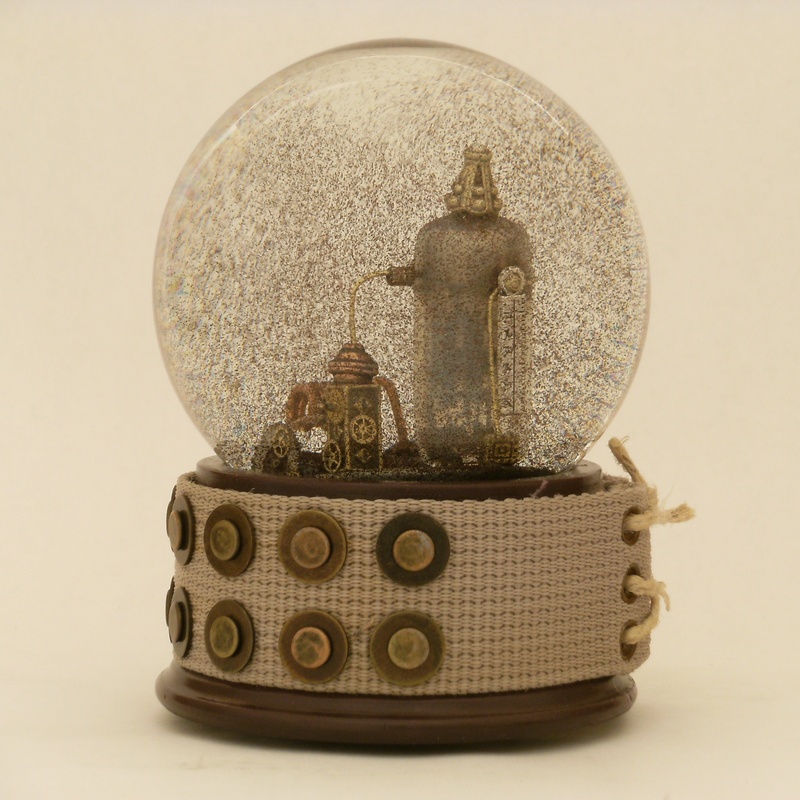 This waterglobe (or snow globe or waterball, if you must) does exactly what it is supposed to do.